LOS ANGELES— Bloods and Crips are “bangin’” for peace after signing a treaty during a highly anticipated meeting at Muhammad Mosque No. 27 which is the Western Regional Headquarters of the Nation of Islam. Nearly everyone stood up when Tony Muhammad, Nation of Islam Western Region Student Minister asked how many had lost a loved one due to gang violence. About the same number of people stood up when he asked who would join the effort of the 10,000 Fearless to help make their neighborhood a safe and decent place to live during the mid-July meeting. Days later various organizations held their first follow-up meeting after the Honorable Minister Louis Farrakhan put out an historic call through student Min. Muhammad for the so-called gangs to unite and stop the violence. The house was packed for the session hosted by student Min. Muhammad. It was heavily attended by gang intervention specialists, community activists, leaders, and concerned citizens looking for an end to violence and real change in their communities. “I’m honored beyond words to see friends of mine, who I know, are front line soldiers, because we’ve got a deep, deep problem in our community, and it runs so deep, that it takes us back hundreds of years,” student Min. Muhammad said. 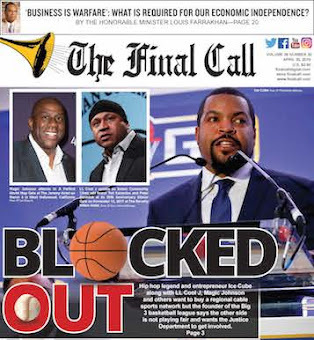 The meeting focused on solutions and came less than a week after more than 2,000 so-called gang members and peace keepers swelled the Scientology Community Center in South L.A. for the initial July 17 United Hoods plus Gangs Nation peace and unity summit. “We’re dealing with the residual effects of a destroyed people … and we, both Black and Brown and Red have been beat down so far, that we have somewhat taken on the mind of those who dominated us, and now we are on remote control doing it to ourselves,” said student Min. Muhammad. The message of peace, love and respect was conveyed by speaker after speaker, who spoke with a sense of urgency to the audience during the initial July 17 meeting. Min. 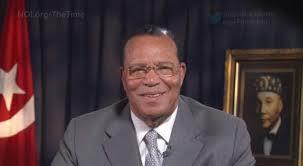 Muhammad said he called the Bloods and Crips on behalf of the Honorable Minister Louis Farrakhan. He was honored, multiplatinum rappers The Game and Snoop Dogg stood with him, and that the people responded as indicated by the massive turnout, student Min. Muhammad said. He also thanked the Church of Scientology for opening their doors to the Nation and the community for the critical community meetings. The plan is to coordinate the best practices from everyone who has already been putting in work to solve the problem of violence in South Central, student Min. Muhammad said. He urged everyone to work together in their lane for the overall goal. “Yes! Police have got to back up off of us, but, at the same time … ain’t no cameras around … when we’re looking at a bloody body,” he stated. Indigenous community activists and organizers, including Alex Sanchez of the gang intervention effort Homies Unidos, have consistently worked in the streets helping the community. They answered the call to come together and are participating because they also want to bridge the gap between Black and Brown communities. “We felt welcomed! We felt welcomed, and that’s the acknowledgement. As soon as you acknowledge that human being, you’re acknowledging somebody of this earth as your brother, you’re sister. We’re all one,” Mr. Sanchez stated. Carolyn Clark, founder of Sisters Working Against Gang Violence and a retired member of the Westside Rollin 20s said the role of women in the work is vital. “I think that the women need to be noticed more. They need to be on more of these panels. They need to be out in the field more, and they need to be doing more,” said Ms. Clark. Messages of self-sustainability and availability of resources was a common theme expressed throughout the meeting. The room was filled with hope and sparks of creativity as many excitedly discussed ways to improve not just the streets, but their homes, families, and the well-being of individuals. Some ideas included community policing and education, recycling Black dollars, economic development, creating re-entry programs, developing job, education, and financial resource hubs, community gardening and urban farming and launching youth programs. Be patient with each other, and shun money as a motive, Min. Muhammad encouraged. “If that’s your motive, the government will sucker you into the money, and then control you, and give you just enough to fail,” he said. Credit for the good works they were planning goes solely to God and the purpose is to unite, not create a new organization, student Min. Muhammad continued. Likewise for more than 100 men—many of them Crips and Bloods who marched peacefully to LAPD headquarters under the helm of The Game’s organization H.U.N.T. (Hunt Us Not Today—Hate Us Not Today )on July 8. 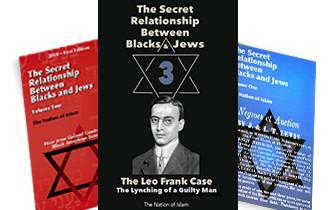 They were flanked by the Fruit of Islam (F.O.I.) 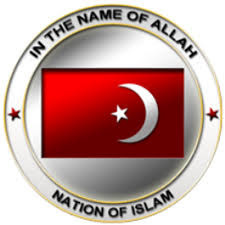 who are the male members of the Nation of Islam on their walk there. The Game co-founded the group with several others, including Problem, a rapper and his best friend. “My decision to walk down there with Snoop, who also didn’t want to walk—I had to damn near drag him out to walk down there—it was a decision made for your children, your children more than mine,” the platinum selling artist said. His children do not face what he did or what the average child in South L.A. endures, he said during the summit. Snoop said much of what happens is due to the need for communication when it comes to police engagement in Black communities. “A lot of times when these situations go awry, there’s a miscommunication at some point. It’s because police have not been used to being around these kind of people or this certain situation or what not,” Snoop told The Final Call. It just so happens the men’s peaceful gathering outside LAPD headquaters occurred on the same day new recruits were graduating Game and Snoop pointed out. “Today brings that situation to a forefront, to where these new recruits that are going to be hitting the streets will get a chance to meet all the people that they’re going to be running into,” Snoop said. “They’re going to be able to see that we’re not villains and thugs. We’re real humans just like they are and they gotta give us that respect and that dialogue before they pull their gun out,” Snoop added. “It’s not about Game. It’s not really even about my children. It’s about yours, and I love ‘em, and I’m out here with ‘em, and I was one of ‘em and I understand,” The Game said. It takes years before legislation gets signed and laws get passed, he said. “It’s about what we gone do right now! Today,” he added, as he struck the podium with emphasis. Min. Muhammad said it took courage to do what the two celebrities did. The Game said he was a very affiliated gang member from Westside City Block Compton Piru, but in a different way. Among other things, he uses his social media platform, which reaches millions of fans, for positive change. Everyone wants to kill, he stated. “But ask the same n——r with the gun if he ready to die, and they’re going to say no.” So if you ain’t ready to die and he ain’t ready to die, why you gonna shoot him homie? He ain’t ready to die, and are you going to be ready to die when the gun is pointed at you?” he asked. 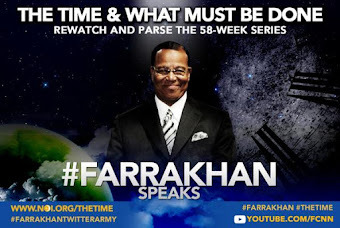 He continued saying he takes tutelage and wisdom from the Honorable Minister Louis Farrakhan. “And I don’t have to be a Muslim to do that, and I am empowered. I am empowered by the F.O.I. and Muslim community as the pastor of my church is Bishop Noel Jones, so I don’t have to make a decision to be with this person or that person. I take wisdom from whoever gone speak it,” he said. H.U.N.T.’s next steps include weekly meetings with LAPD Chief Charlie Beck and other top brass, and Mayor Eric Garcetti, both of whom attended the July 17 summit at Muhammad Mosque No. 27, according to Carlos McCullers, H.U.N.T. co-organizer. Big Boy, popular radio host of Big Boy’s Neighborhood on 92.3 FM/REAL, helped to promote the July 17 peace summit. 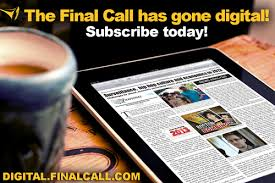 “Right now, we all gotta be held accountable for everything we said up there, for showing up and saying we’re going to do our jobs,” Big Boy told The Final Call. Student Minister Muhammad encouraged everyone to avoid envy and jealousy and become allies in working toward real change. 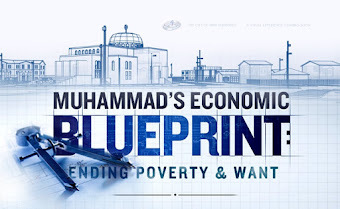 “Don’t expect the Nation (Of Islam) to do it the way you do it, but we’re going to come hard! Don’t expect the Black Panther to be like the Nation of Islam or the church to be like the Black Panther or the Blood to be like the Crip, or Game gotta be like Snoop or Snoop gotta be like Game, or Big Boy gotta be like somebody else,” he said. Black and Indigenous, male and some female, gang members and those affected at their hands flooded the three entrances, and stood in long lines to get inside the initial July 17 meeting. A cafe and lobby were transformed into two overflow rooms, and outside on the street in front of the center, people listened and watched via loud speakers on a jumbo screen. The hallways and aisles were packed as people leaned over upper level balconies, while others sat on the floor. The facility was filled over capacity, with celebrity hip-hop artist will.i.am among attendees. Gang members and interventionists spoke from the heart about the need for peace and hope in the new efforts toward unity. Ansar Muhammad, a co-founder of the H.E.L.P.E.R. Foundation gang intervention and prevention organization, feels the efforts are a step in the right direction. “The next phase is community grassroots organizing efforts around the violence and each neighborhood representative that has an influence in the community must go back and organize block by block in a community affected by violence,” he stated. Tino Torres, a 10-year gang interventionist from East L.A., said Black and Brown unity should be obvious by now. He shared how he is pained over the brutal beating deaths of two young girls, and electrified the audience when he challenged Europeans colonization, theft and murders of his people. Blacks who were enslaved could relate, Mr. Torres said. “Each of us is so valuable that we need to stay alive. We need to build the peace with each other, Brown on Brown, Black on Black, Black with Brown … because I’m tired of contributing to an $80 billion industry, prison complex to lock us up,” he said. Rapper West Coast Kam, also a Muslim, commended everyone’s efforts and said the work is in the streets. “Charity and love start at home first,” he said before bringing up some interventionists and rappers, including Jerome Muhammad, a.k.a., Shorty from Da Lynch Mob. “We started the first half of our lives probably doing the devil’s work, but as long as God gives us the energy to do something about it, we doing the positive thing,” Kam said. “This isn’t something that just happened in a vacuum. The work has been done over the years,” said Min. Muhammad. The 2016 gang truce comes in the midst of his work to galvanize peace throughout the streets of L.A., including monthly Southern California Peace Rides. The Peace Rides, which include groups and clubs who ride motorcycles, low riders, mini bikes and drive Corvettes, are coordinated in conjunction with the Southern California Cease Fire Committee and a host of organizations, activists and artists and culminates in a park rally for peace called UPFest.